Set at a famous high school for the super-wealthy, this is a puppy love story centered on a poor girl and the F4 gang of rich kids headed by the rough and fearless Jun-pyo Koo. Geum Jan-Di (Hye-seon Ku) is a girl from a poor family but has an unrivaled sense of optimism and drive and is by chance admitted to a prestigious private high school. 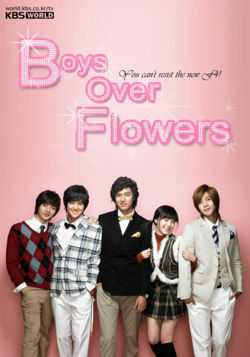 There she meets the infamous group of four astonishingly good looking and rich boys who are known as F4. The group's leader is Koo Jun-Pyo (Min-ho Lee), who is a spoiled heir to world-leading conglomerate Shinhwa. He is joined by mysterious and breathlessly handsome Yun Ji-Hu (Hyeon-jung Kim), So Lee-Jeong (Kim Beom), and Song Woo-Bin (Kim Jun). Their love story moves from Seoul to New Caledonia to Macau.